Stains come in a variety of opacities, are oil or water- based, and they both have advantages and disadvantages. Remember, too, as you look at the selections of clear, tinted, semi- transparent, and solid stains, that the more pigment you add, the less you are going to see of the natural wood. 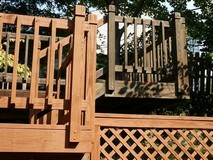 Do you want to see the natural wood color showing through on your deck? Then, you’ll want an oil-based stain. Oil soaks in and penetrates through the surface better and gives the wood a richer look. However, you’ll spend more time maintaining your deck since most of these stains last only two to four years. Solid color, water- based stains have lower volatile organic compounds (VOC’s) and because of this, these stains are better for the environment. They are also more durable, lasting seven to eight years, but you’ll hide the natural look of the wood. Still, a water-based solution dries faster and cleans up easier. Mr. Morrell mentioned another benefit of the water-based deck stains: If your deck is new and made of redwood or cedar, a water-based stain will seal in the tannins so they don’t leach out over time and give your deck a splotchy coffee-stained appearance. Depending on the humidity of your region and how high off the ground your deck sits, a mildewcide in the product may be beneficial. But some mildewcides increase the VOC’s, so you might be tempted to buy a stain without one, and add a “green” mildewcide. This sounds “earth-friendly” but is not a good idea. When you mix an additive in with your paint or stain, you void the manufacturer’s warranty. Reading the labels and knowing what you want are smarter ways to go green. Take a look at our other Green articles for money saving tips that help the environment.